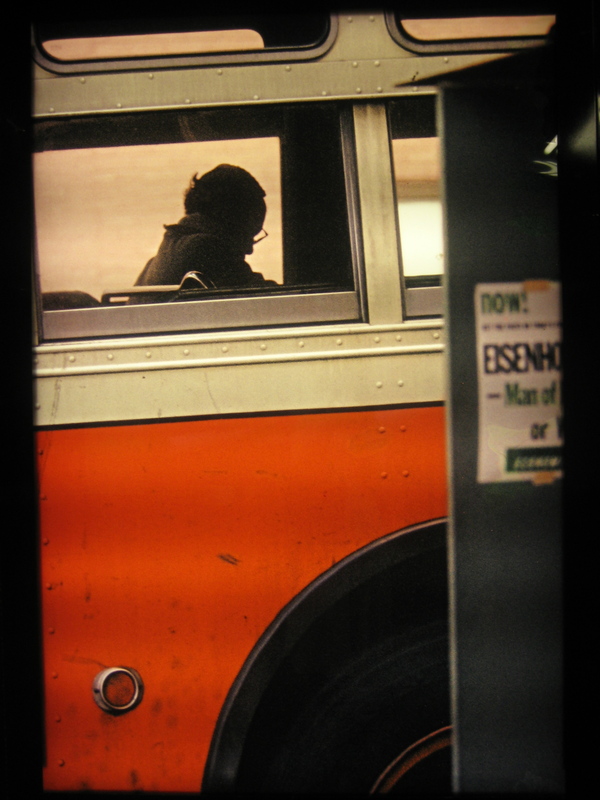 I’ve just watched In No Great Hurry: 13 Lessons in Life with Saul Leiter, a 2013 documentary by Tomas Leach. Understated and quiet, the film follows Leiter around his life, self-consciously walking the line between wanting to get closer to the man and the artist while not wanting to be intrusive — a tension that runs through the film and gives a tentative, hesitant feel to the camera work and Leach’s side of the conversation. Leach’s awe of Leiter was palpable in the film and understandable — but it sometimes got in the way of his filmmaking; it was visible in his choices to the point that it narrowed Leiter’s story and the viewer’s experience of it. Most of the film was shot in Leiter’s studio in the East Village, where he’d lived since 1952, and cuts between Leiter speaking to the camera, making coffee, slowly rummaging through piles of film, prints, papers and boxes accrued over decades, and walking the streets near his studio looking for things to shoot. The 13 lessons provide the film’s structure, but within it, the meandering pace and lingering focus on everyday surfaces keep Leiter more obscured and contained than revealed, which I found unsatisfying. And which drove me to pause the film multiple times to revisit Leiter’s work to get a deeper and more direct experience of his way of looking and seeing. Yet by the end of the film, I found the low-key encounter with Leiter as directed by Leach satisfying on its own terms if not mine. It gave me a more complete picture of Leiter than I’d had, and I walked away convinced of the value of being, like Leiter, in no great hurry — either in life or in art. And pausing to follow my own meandering diversions made watching the film a richer and more complete experience for me.